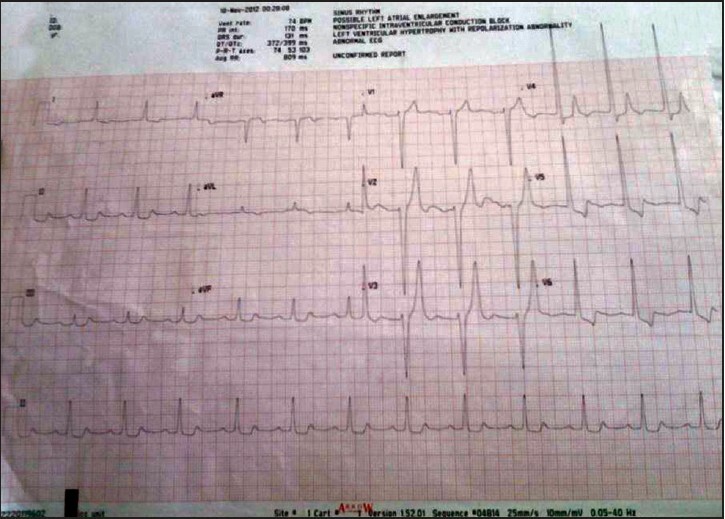 Here, we present a case of life-threatening hyperkalemia who presented with profound ECG changes and shock. The management guidelines and ECG changes associated with hyperkalemia are also discussed. A 35-year-old male patient who came in our emergency department with the complaints of severe generalized weakness, irritability, and uneasiness. Patient had nonrecordable pulse, blood pressure (BP) and was highly irritable. ECG suggestive of broad QRS irregular junctional rhythm with prominent T waves [Figure 1]. Patient was on some treatment for renal disease and old records were not available. Arterial blood gas revealed S. potassium of 8.5, pH-7.2 and HCO 3 -15. With close cardiac monitoring aggressive treatment for hyperkalemia and hypotension was started urgently with the injection calcium gluconate 10 ml intravenous (IV) stat, injection sodabicarb via separate line IV stat, glucose + insulin + calcium gluconate infusion, nebulization with B-agonist, slow IV fluid and vasopressor support. Temporary pacemaker and defibrillator kept bedside for SOS use if no response seen in 10 min of medical therapy. But no change in vitals or ECG? We started repeated injection of calcium gluconate for membrane stabilization under close continuous ECG and vitals monitoring. On repeated calcium gluconate progressive narrowing of QRS with gradual appearance of P wave occurs [Figure 2]. After 5 injection of calcium gluconate repeatedly over 20 min. ECG was normal sinus rhythm [Figure 3]. Calcium gluconate injection stopped, glucose insulin and nebulization was given continuously. After around 1 h BP was 96/60, UOP - 150 ml with patient comfortable on the bed and responded to command. Final ECG - normal sinus rhythm with left ventricular hypertrophy. In stable condition patient referred for Dialysis to Medicine Nephrology Unit in an ambulance without TPI. Hyperkalemia is a life-threatening metabolic condition and is defined as serum potassium level of >5.5 mmol/L. The common risk factors for hyperkalemia include renal insufficiency, use of ACEI, angiotensin receptor blockers, potassium-sparing diuretics, potassium supplementation, and excessive consumption of potassium containing diets. The patient we described here had this life-threatening condition as he has renal impairment. The patient was commenced on IV calcium gluconate and IV glucose/insulin immediately after ECG and history of renal disease. IV calcium, insulin with dextrose infusion, IV sodium bicarbonate, nebulized salbutamol and cation exchange resins are the standard treatment of hyperkalemia. , Resistant hyperkalemia may require emergency dialysis. ,,,, Temporary pacing is a life-saving procedure with or without dialysis. ,, In this particular patient, hyperkalemia was quickly normalized by medication with repeated calcium gluconate and glucose/insulin infusion. Although laboratory tests are the gold standard in the diagnosing changes in the serum electrolyte concentration, delays may be experienced in obtaining results. Hence, in many cases, early diagnosis and empiric treatment of hyperkalemia is dependent on the physician's ability to recognize the electrocardiographical manifestations of hyperkalemia. The most common electrocardiographical changes associated with hyperkalemia include the earliest manifestation of tall tented or peaked T waves with a narrow base, reduction in the amplitude and eventual loss of P waves. This is followed by bizarre widening of the QRS interval, then idioventricular rhythm with the widened QRS merging with the T wave to form a "sine-wave" which may culminate in ventricular fibrillation. , Despite this, the classic ECG changes do not always manifest and the relationship between serum potassium concentration and ECG changes varies among people. Hence the ECG alone is not reliable for mild to moderate hyperkalemia. Minimal changes on the ECG may be seen in severe hyperkalemia. Early stages of hyperkalemia may manifest with only shortening of the PR and QT interval. Complete heart block with widened QRS complex has already been reported. Many less known ECG changes associated with hyperkalemia have been reported. These include hemiblock due to depressed supraventricular conduction, left or right bundle branch block, bifascicular as well as trifascicular blocks. Of importance is the fact that hyperkalemia can produce ECG changes, such as ST segment elevation that mimic acute myocardial infarction. ST segment depression and T wave inversion, which similarly occur in cardiac ischemia have also been reported. Anteroseptal and inferior wall pseudoinfarction pattern due to hyperkalemia have been reported in literature. Hence, our patient recovered from hyperkalemic crisis with aggressive medical therapy and close cardiac monitoring without the need for temporary pacemaker and defibrillation, which can be applied during transportation or at centers where facilities for temporary pacing not available. 1. Chew HC, Lim SH. Electrocardiographical case. A tale of tall T's. Hyperkalaemia. Singapore Med J 2005;46:429-32. 2. Parham WA, Mehdirad AA, Biermann KM, Fredman CS. Hyperkalemia revisited. Tex Heart Inst J 2006;33:40-7. 3. Mckellar G, Alfonzo A, Isles C. Hyperkalemia: Causes, electrocardiographic changes and management. J R Coll Physicians Edinb 2006;36:5-11. 4. Walter RB, Bachli EB. 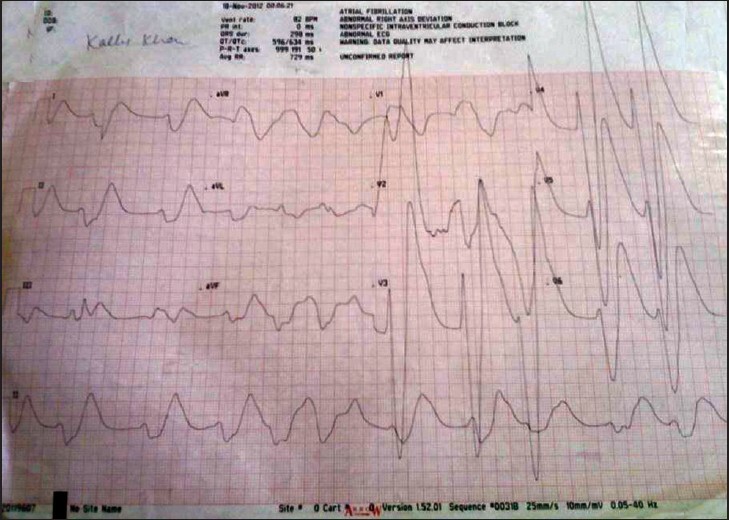 Near-fatal arrhythmia caused by hyperkalaemia. Heart 2002;88:578. 5. Luzza F, Carerj S, Oreto G. Images in cardiology: An unusual hyperkalaemia induced block. Heart 2001;86:686. 6. Kim NH, Oh SK, Jeong JW. Hyperkalaemia induced complete atrioventricular block with a narrow QRS complex. Heart 2005;91:e5. 7. 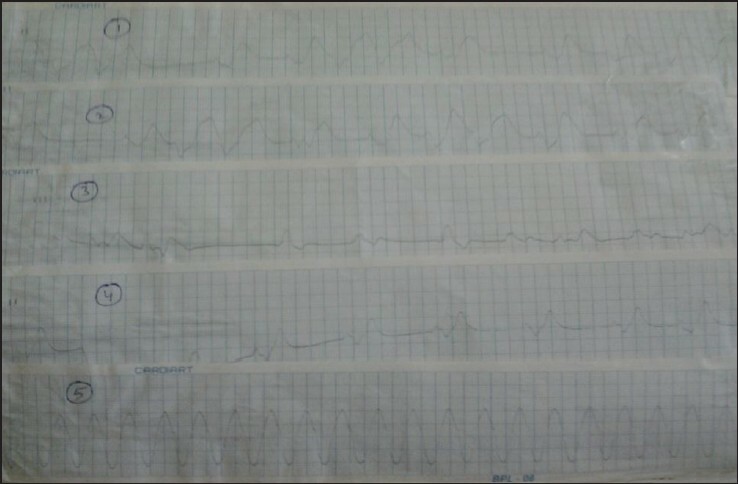 Goranitou G, Stavrianaki D, Babalis D. Wide QRS tachycardia caused by severe hyperkalaemia and digoxin intoxication. Acta Cardiol 2005;60:437-41. 8. Tran HA. Extreme hyperkalemia. South Med J 2005;98:729-32. 9. Kahloon MU, Aslam AK, Aslam AF, Wilbur SL, Vasavada BC, Khan IA. Hyperkalemia induced failure of atrial and ventricular pacemaker capture. Int J Cardiol 2005;105:224-6.